Cancer Cluster Bill 380 Becomes Law for Maryland Residents!!! Victory for Maryland Residents! Governor O'Malley signs Cancer Cluster bill into law. Senator C Anthony Muse has been working extremely hard again this legislative session to get this bill passed and with the help of Juice 4 Life Board Member Brandi Calhoun along his side in Annapolis day in and day out , they were able to get it done! This bill will require a work group to be put in place and the Department of Health & Mental Hygiene will have to report any findings of cancer clusters and environmental causes of cancer. 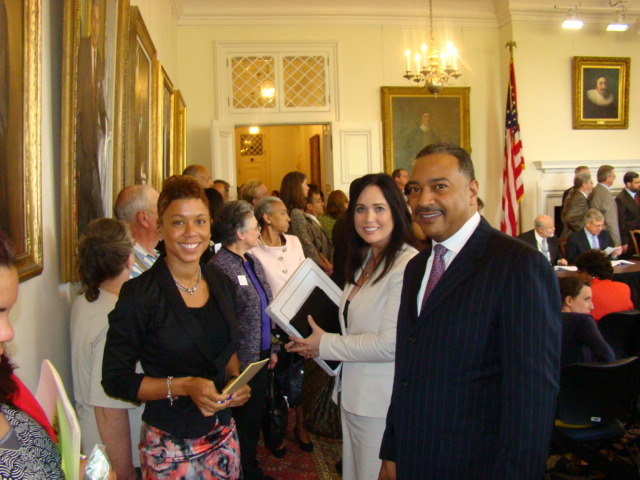 May 2nd was the bill signing and along side Governor O'Malley stood Senator C. Anthony Muse and other representatives from Juice 4 Life, The Kristen Renee Foundation & The Cancer Support Foundation. This was such a joyful day for all of us! Maryland is the first state to have this law and Juice 4 Life plans to work with other elective officials to help establish this law nationwide. Juice 4 Life Founder, Charnise Calhoun Carter, and Board Member Senator C. Anthony Muse at the bill signing. Proposed Study To Determine Environmental Carcinogens In Md. A cancer in the community. Lawmakers consider a study to determine the extent to which environmental poisons may have caused and may continue to cause cancer in certain areas of the state, most notably Fort Detrick. Political reporter Pat Warren reports from Annapolis where neighbors made a stand. In this WJZ investigation last November, Eyewitness News traveled to the homes of people living around Ft. Detrick in Frederick, including cancer patient Dottie Blank. DISCLAIMER: Juice 4 Life, Inc. makes clear that we do not recommend the abandonment of conventional therapies nor do we assume the risk of any alternative therapies. © Juice 4 Life 2023. All Rights Reserved. We would love to know what you think about Juice 4 Life! Let us know what your thoughts...leave a message!